Right, let's nail the colours to the mast from the outset: we think this is one of the best-looking bikes you can currently buy. That would go a long way to justifying the purchase if you're looking to pose on the sportive start line, but once you're out on the road you'll be wanting some performance to go with those looks, and Wilier are confident the Gran Turismo will deliver. It's a sportive bike, so it's a bit more upright than Wilier's race bikes, right? Wrong. That would be the approach of many brands, but Wilier are, it seems, quite happy making road bikes with road bike geometry, thankyouverymuch. The Gran Turismo is no exception; if you compare the relevant vital statistics of the GT and the range-topping Cento1 (angles, reach, head tube, stay length) there's barely a fag paper between them. As far as angles go, it's a pretty traditional road iron. So what makes it sportivey then? Well, instead of making the rider switch to a new, less extreme position, Wilier have instead tried to make the bike as comfortable as possible in their traditional geometry. "Comfort is a priority for every Wilier model, whether we’re developing bikes to win World Road titles, Ironman Championships or your next weekend challenge", they say on their website, before launching into the merits of the fabled lateral stiffness/vertical compliance holy grail. The back end of the GT features the asymetric technology developed for the Cento1; this isn't so apparent in the shape of the stays, it's more to do with the internal layup of the Carbon which has to cope with very different stresses on either side of the wheel. 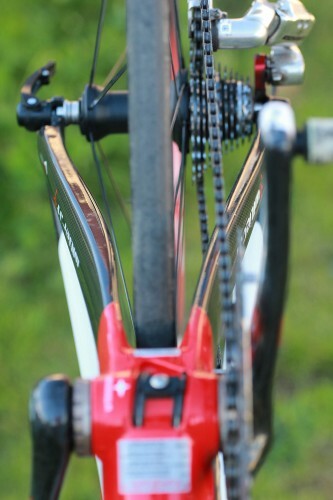 Up front Wilier have introduced the 'Razor Edge Design concept'. Whassat? 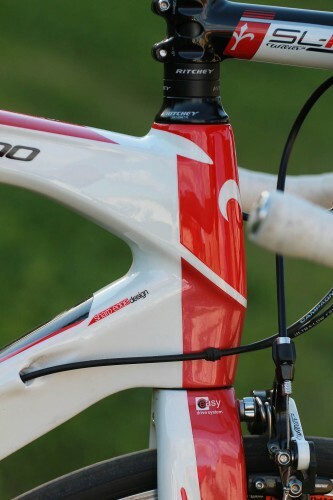 In essence it's the use of overlapping tubes at the head tube to 'form a single integrated unit' – we're not aware of many bike frames that aren't a single integrated unit – and the use of square (at the head tube) to rounded (at the seat tube/bottom bracket) tube profiles. All this is to maximise stiffness at the front end and also make the bike as comfy as it can be. 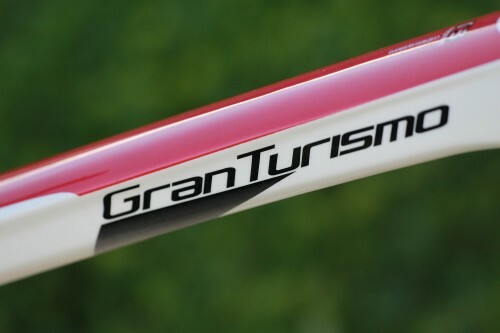 You can get the Gran Turismo in three different finishes; our favourite is the semi-naked black and grey but beggars can't be choosers so we'll have to put up with the still-very-fetching red and white one that Wilier have lent us. It's built up with a mixture of good quality components (Athena 11, Fulcrum Racing 3s, FSA chainset and finishing kit) and though they're not what you'd pick for a lightweight build the bike still weighs in at a very respectable 7.65kg (16.8lb). We'll be putting it through its paces over the next month and we'll report back as soon as we can.